I have been excited about Lucy Crehan’s book for what seems like eons, and it does not disappoint. Unlike Amanda Ripley’s (also excellent) The Smartest Kids in the World, Crehan’s book has real direction and pulls together helpful strands, always with a focus on what we in the UK (or in the USA, as she makes frequent allusions to both countries) might learn from these successful systems. Crehan’s style also fuses strong, robust research with anecdote, all told in a witty and engaging style evoking a sense of a travelogue. Early on Crehan refers to her research as a ‘geeky gap year.’ Many teachers would surely envy her travels, but she does not shy away from evoking some of the tougher aspects of travelling from place to place, spending around a month in each country, teaching, observing, helping and discussing education. 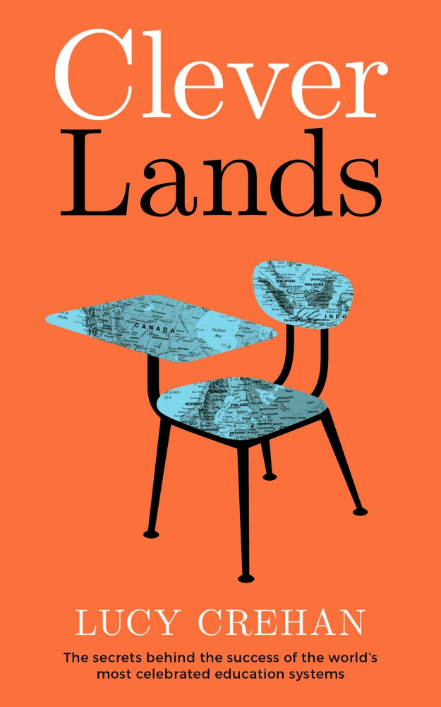 There is much to be learned from almost all of the countries explored by Crehan, and I was pleasantly surprised by which I learned the most from in reading Cleverlands. As a former ‘progressive’ teacher, I used to hold up Finland as an example of all that progressive education could accomplish: comprehensive, child-centred, homework-less. But as its PISA results have flagged, and my own pedagogical values have shifted, I have increasingly turned my back on this previous analysis, listening instead to those who claim Finland’s previous results were down to its earlier, more traditional methods. And yet I learned much from Crehan’s chapters on Finland; perhaps more so than any of the other chapters. She points out that in 2012, Finland was still the highest scoring non-Asian country. Her analysis ranges over the late school start – age 7 – and the counter-intuitive ‘learn through playing’ ideology that pervades these early years. But the focus in those years is on making children school ready, and Crehan cites extensive research showing that it makes no difference if children begin school early or late. In fact, trying to teach very young children difficult skills may even prove counter productive: ‘like scattering seeds on a path, trying to teach children to read aged one or two will be unproductive, as they don’t have the skills, the language abilities or the cognitive capacity to be able to do it yet.’ Moreover, such a focus could ‘detract from the time they could be using to develop the knowledge and skills that are needed’ to be ready to learn to read. Crehan considers the success of Finland’s comprehensive system to be due to its slow lead-in time, extensive training, and oversight and inspection of teachers and schools until its full establishment. And Finland is fully comprehensive, down to mixed ability classes, which make a number of appearances in the book. The focus for the Finnish teachers is on the weakest kids: one teacher opines ‘the brightest kids, they’ll learn anyway, whatever you do with them.’ This equity is also reflected in school structures; only the Headteacher is different in the hierarchy. There are no department heads, or senior teachers. There is no performance related pay. Teachers are continuously developing their own practice independently, genuinely engaging with research and education and cultural writing, and there is a palpable culture of believing this makes them better at their jobs. Crehan warns, though, that this is only possible with a highly motivated workforce. Of the often celebrated ‘teacher autonomy’ of Finland, Crehan has much to challenge, beginning with a 1996 report on Finnish schools which found: ‘whole classes following line by line what is written in the textbook, at a pace determined by the teacher… you could have swapped the teachers over and the children would never have noticed the difference.’ From Crehan’s observations, she notes a ‘consistently traditional approach’ in classrooms, with lessons ‘led by the teacher, but with substantial whole-class interaction.’ High quality textbooks are ubiquitous. Teachers are not forced to use these, but she points out it would be foolish not to. As Finland has no official exams until age 18, these textbooks are not focused on drilling to a test, but instead on promoting ‘engagement and deep understanding’ of the topics. Where Finland’s values are reflected in each of its schools, Japan’s system seemed the least coherent. Whereas middle schools invoke military discipline to toughen kids up for high school (Crehan includes one of many brilliant details in outlining the lightweight uniform being entirely useless in winter, but due to layers and coats being forbidden the children ‘buy self-heating pads, which they put in their socks and stick to their backs on the really cold days’), the primary schools are almost completely devoid of any behaviour system, with teachers relying on the children to discipline each other using peer pressure. Teachers are graded A to E, but never know their grade, and they are moved from school to school as their district sees fit. The families in Japan demonstrate strong support for education, with mothers expected to ‘retire’ when pregnant and devote their lives to raising kids, and the school constantly admonishing parents for not supervising children’s homework if it is not done. More positive aspects include the curriculum: in Japan it is, according to Crehan, narrow but deep. Teachers share planning, and all teach the same lessons. They support struggling pupils outside lesson time. Interestingly, the parents in China ‘tend to play down their children’s successes, because they see it as their role to promote effort in their children… when parents from Eastern cultures point out a child’s failings or mistakes, its whole purpose is to allow the child to grow and improve.’ This puts the writings of Amy Chua into perspective, and helps to explain to a Western mindset why, though the Chinese mother might seem ‘cruel’, it is, in fact, working from a different paradigm in raising children’s expectations of themselves. Like Japan, schools constantly communicate with parents and hold them to high standards. In lessons, pupils are taught didactically, but there is little time for extended practice – this is done as homework. There is much to learn from this extraordinary work, but one aspect I found compelling was the teaching in nearly all the above examples in mixed ability classes. Since moving to Michaela, I have really enjoyed teaching streams – lessons move at a pace the very vast majority of the class is comfortable with, and I can give whole-class feedback that is relevant to all pupils. Teaching to the top in a mixed ability class is not impossible, but it does rely on the weakest children working the hardest: doing more homework, and coming to teachers for individual support. This is possible in a culture where hard work and personal struggle to achieve are normalised. The practical reality, in my experience, is that the weakest kids are also the least invested: the least likely to do homework, and the least likely to attend additional clubs (non-teachers wouldn’t believe how hard it is to get kids who have fallen behind to attend catch-up clubs put on specifically for their benefit). But what we can take from the mixed ability argument is a need to pitch our curriculum to the top, so we teach all children the same stuff. This could be done by changing the allocation of lessons, so weaker children do the same high-quality work, but just have more time to spend on that tough material. This book is fascinating for its research, but it is also a crucial one for all educators in that it reminds us that education is about values. More than once, Crehan asks: ‘would you want this in your country?’ This is why education will always be a knotty issue, because we do not have a consensus on values. We know what works to improve pupils’ behaviour, learning and habits, but what we don’t know is whether we all want pupils to behave in a certain way and know certain things. This book is crucial to prompt reflection from all educators.